�����Heritage Auctions hosted a Signature Sale in Dallas this past week; there were over 2,700 lots sold including a sizable amount of U.S. Gold. 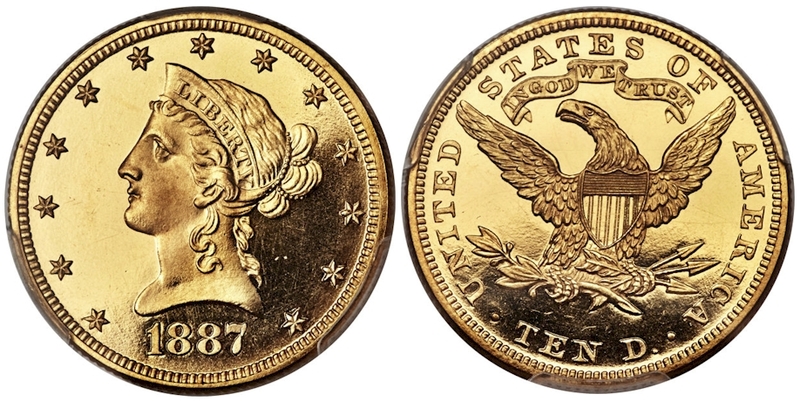 The very rare for the grade 1887 $10 Gold in PCGS PR64 Deep Cameo with the CAC sticker realized $72,000. This is the only coin certified in PR64, but there are 6 others certified higher with an NGC PR67 Ultra Cameo the highest. 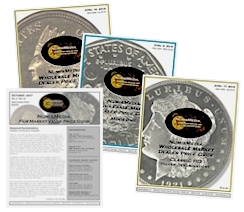 �����There were 271 Double Eagles sold, 44 of those were of the Carson City Mint variety. Most of the CC Twenties were certified in the AU grades, however, the highest certified graded Carson City coin available was the 1893 CC in PCGS MS62 which sold for $14,400. The new owners of the Carson City Twenties from this sale were likely pleased with their final bids as many were hammered at below current Market prices. �����The highest valued coin in the sale was the 1879 $4 Gold Stella Flowing Hair in PCGS PR66 Cameo that brought $228,000. The Market price was listed at $240,000; there are a total of 30 coins certified in this grade and another 15 as high as PR67 Cameo. Below are some of the other highlights from the Heritage Auctions Dallas Sale. �����Gold bullion ventured back over the $1,300 mark at the end of last week; this morning Gold is currently at $1,304.80 and Silver is at $15.33. 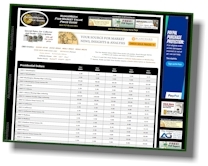 One ounce Proof Gold Eagles in the OGP are trading at $1,350 and Proof Silver Eagles are $40-$41 each. Bags of 90% Silver coins are wholesaling at $10,765 and VG Silver Dollars are $20,575 per 1,000 coins. 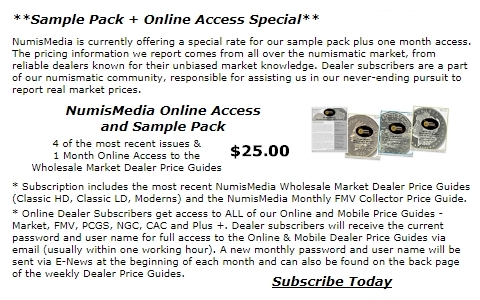 �����Discounting has continued in some of the more popular series, resulting in declining prices for Walking Liberty Half Dollars and Morgan Dollars in particular. This week values have dropped in many of the MS64 and MS65 grades. The 1916 S Walker in MS65 is lower at $4,925 Market and the 1917 S Reverse in MS65 is down to $11,500. The 1927 S and 1928 S are also trending down in MS65. �����There is a long list of declining prices in Morgan Dollars, but in most cases sales are occurring making for a solid two-way market. There are some significant changes: the 1879 O in MS66 is down to $10,350, the 1881 O in MS66 is now at $6,950, and the 1887 O in MS66 is lower at $26,750. As a reminder, these prices are for sight-seen coins and optimistically graded coins typically won�t sell at these levels.